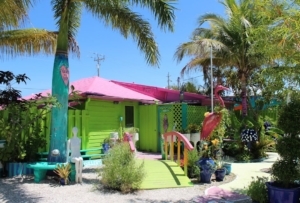 On Friday the 13th in 2004, Hurricane Charley ravaged Southwest Florida. I remember that at the time, Mike and I were traveling home from Michigan. When we arrived, we found a real mess. Being the middle of the summer, it was unbearably hot, and we all appreciated how the Red Cross drove around the entire island passing out water and boxed meals while we cleaned up our homes and businesses. The storm knocked down a pink fence we had. When I noticed that Mike had piled up over 200 feet of pink planking along the side of the road for pick-up, it made me sad. But then I had a Leoma moment. I retrieved all the fencing (it took an hour) and stashed it behind a shed. Mike was delighted (NOT). 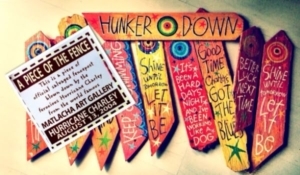 For years, I made art out of pieces of the fencing and attached a little story about Hurricane Charley on the back of each one. Then came Charley’s 10th anniversary and I had another idea. 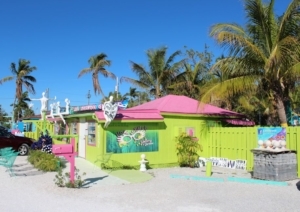 I put the 12 remaining pieces of art I’d made from the pink fencing on sale for $100 each and donated 100 percent of the sales price to the American Red Cross Florida’s Southern Gulf Region (our local chapter). Kind of a belated thank you not only for the water and boxed meals, but for just being there in our time of need. The American Red Cross Florida’s Southern Gulf Region serves Collier, Lee, Hendry and Glades counties. The American Red Cross is where people mobilize to help their neighbors—across the street, across the country, and across the world—in emergencies. Each year, in communities large and small, victims of some 70,000 disasters turn to neighbors familiar and new at the American Red Cross. 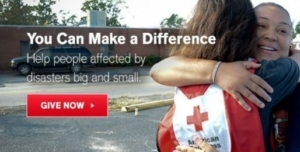 To learn more, please visit American Red Cross Florida’s Southern Gulf Region. And don’t forget. You can thank them with a donation or by giving blood. They want and deserve our help!